We were in Los Angeles last weekend to attend a wedding, but took the time to do some sightseeing and catch up with friends. We arrived Saturday morning around 9:30AM and went straight to Peet's coffee in Marina el Rey. From there we went straight to In-N-Out burger for an early lunch, then off to visit the La Brea Tar Pits and Page Museum on Wilshire Boulevard. Like most kids, I had a fascination with fossils growing up and had heard a great deal about La Brea's famed treasure trove of fossilized animal remains. Before about 40,000 years ago, LA was underneath an ocean, where it will someday return following either an earthquake or runaway deficit spending. 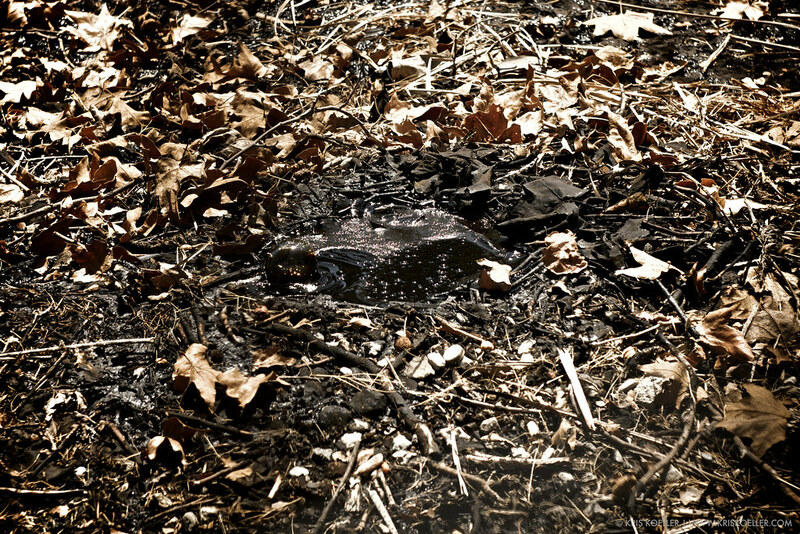 Once the the basin dried, a hole in the ground in central LA bubbled liquid asphalt to the surface as it still does today. Liquid asphalt is a thick, reduced form of crude oil. Its called tar, but tar is actually a man-made substance. The asphalt is warm, gooey and quite sticky. 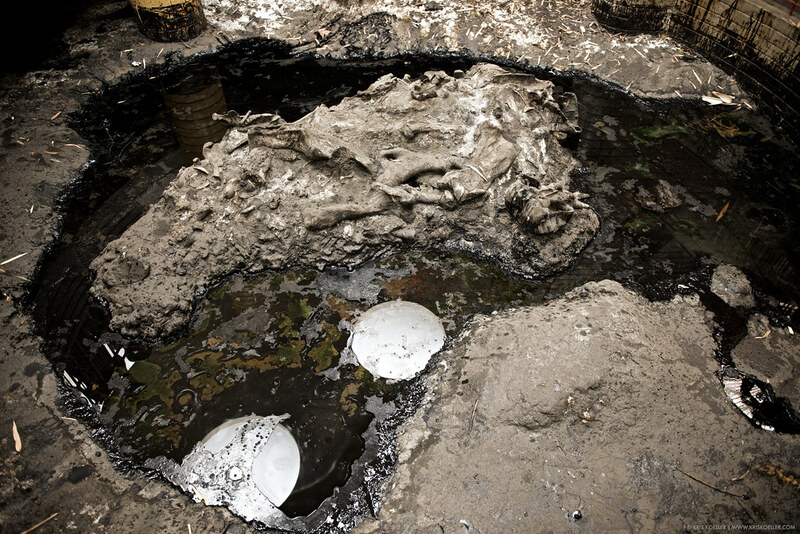 Unsuspecting animals would venture into the tar, get stuck, die and be forever preserved in the pit's morass of goo. Predators would attempt to feed on the trapped animals, often getting stuck themselves and join their prey for eternity and eventually appear alongside them in the nearby Page museum. Although these entrapments were somewhat infrequent, over a period of 40,000 years, they tended to add up. 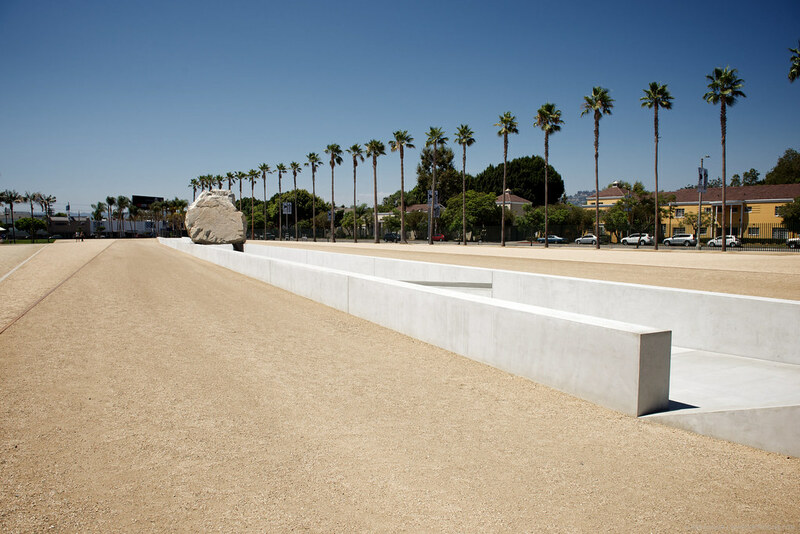 To date over 1 million fossils have been discovered in La Brea, and over 100,000 pounds of remains have been removed. 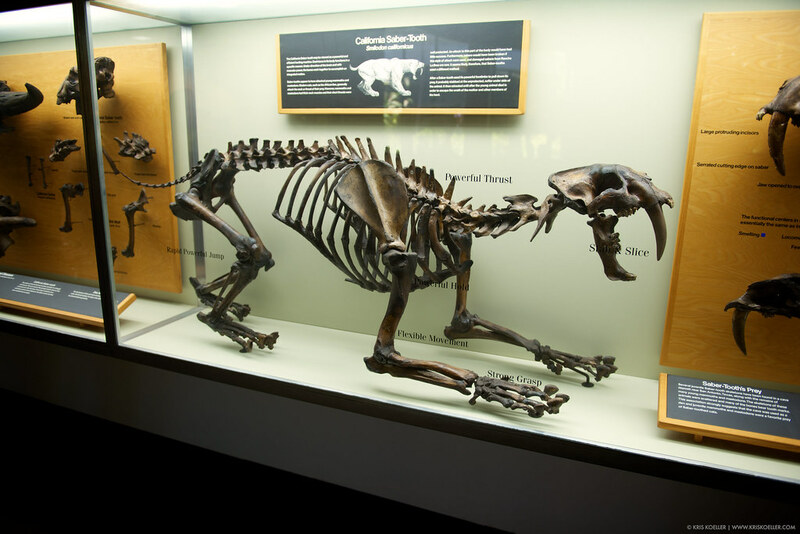 Accordingly, La Brea is the richest repository of prehistoric animals on Earth. Modern excavation started around 1900 and continues today. 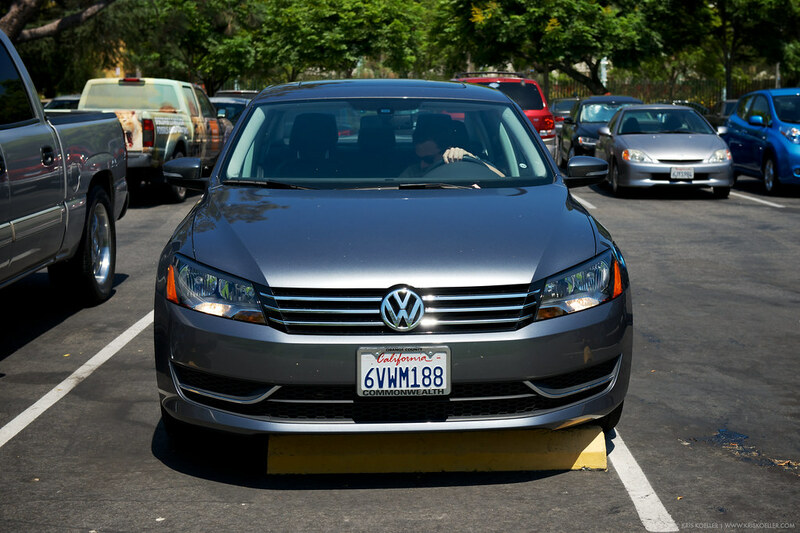 After may attempts at parking the rental car, we arrived at the Tar Pits and Page Museum. The smell of asphalt permeates the air, and gives you the impression a nearby paving project is underway. In parts of the park, the smell is quite intense. Homes and businesses line the park, and I frankly can't imagine living around that on a daily basis. Between the smell and the methane, perhaps it goes a long way in explaining daily life in LA. 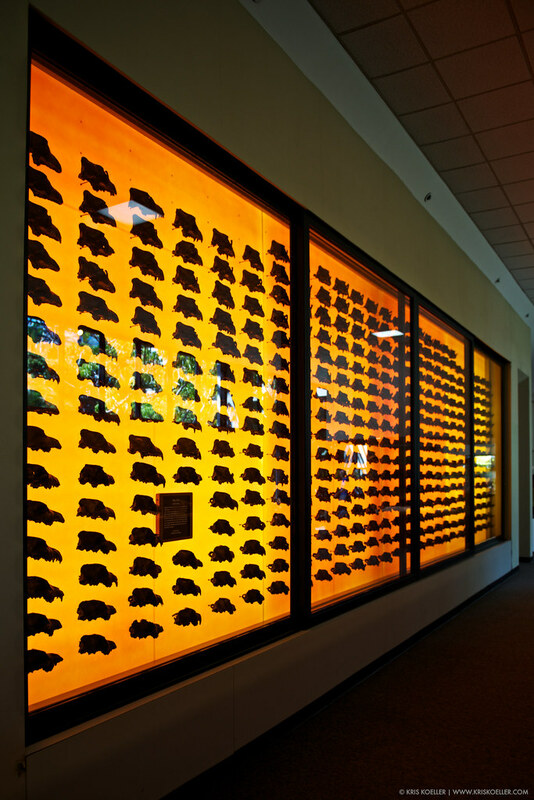 A visit to the Tar Pits includes a walk through the Page Museum's impressive collection of fossils, and a guided tour of the La Brea excavation sites and surrounding grounds. We started with the tour which explained the history of the area and the recent history of the excavation efforts by scientists from around the world. Our docent was both entertaining and well-informed, which made the walk that much more enjoyable. Excavation pits are large, dug-by hand and dripping in asphalt. They also smell badly and are incredibly hot. Other than all of that, I imagine its a pretty impressive place to work. Excavation is slow-going as the scientists are careful not to damage specimens or disturb their surroundings. Much can be learned about the animals' daily lives, diet and social behaviors by examining the items collected nearby. 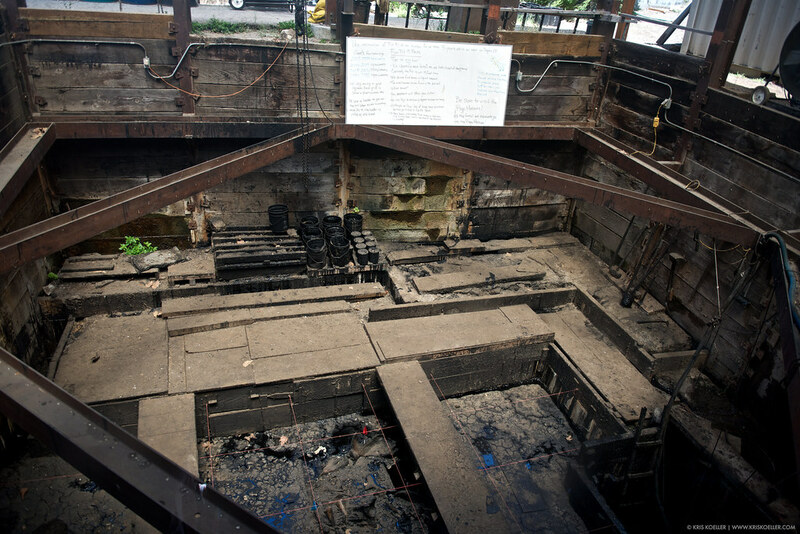 We visited the largest, longest-running excavation pit, Pit 91 under the searing 99-degree heat. Afterward we stopped by the original La Brea visitor center, built around an early pit but now since abandoned. Before the current park and museum were built, this was the extent of the exhibits offered to curious visitors. After an hour-long tour of the grounds, we went inside for an air-conditioned exploration of the many exhibits in the Page Museum. What impressed me the most was both the variety of the animals represented, and the completeness of the skeletons. 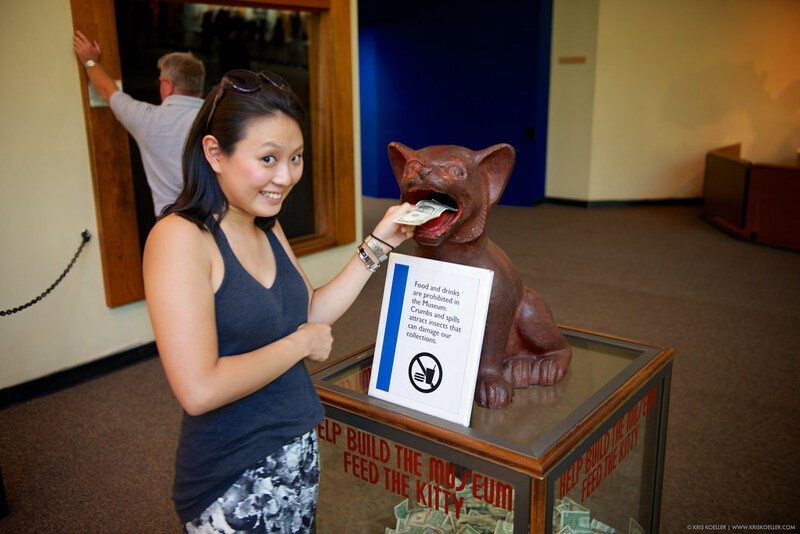 The museum's operations and science is mostly funded by visitor fees, grants and the generosity of anonymous patrons. Despite living in California for over 15 years, I was unaware of a State Fossil and State Vertebrate. Both of these august titles are bestowed upon the California Saber-Toothed tiger, as fearsome mammal as there ever was. Those front fangs appear entirely impractical, but send an unambiguous message. Other impressive skeletons on display included an extinct form of camel, which unbeknownst to me, originated the species in North America before migrating over the Behring Land Bridge to Asia and Africa, then promptly becoming extinct. A giant mastodon, and this species of giant jaguar were also remarkable. If Darwin awards were given in the Animal Kingdom, I would nominate the woeful Dire Wolf. Over 1,600 skeletons of this species of wolf have been found at La Brea, by far the greatest of any one animal. One entire wall of the Page Museum is dedicated to the futility of this creature, which, surprisingly, is today extinct. 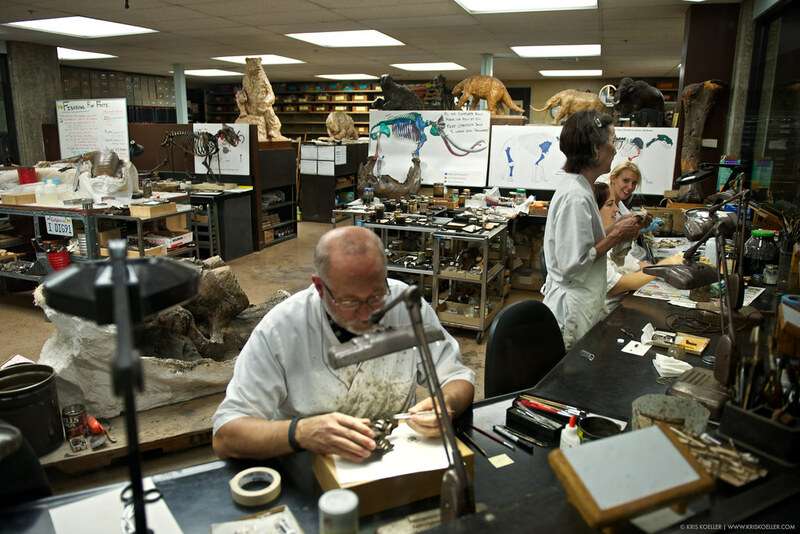 There exists within the Page Museum a functioning laboratory of real paleontologists hard at work restoring, identifying and cataloging specimens found nearby. Fittingly, the lab is called The Fishbowl. The scientists appeared hard at work cleaning fossils, and hard at work trying to ignore guests; mostly the guy with the giant camera. 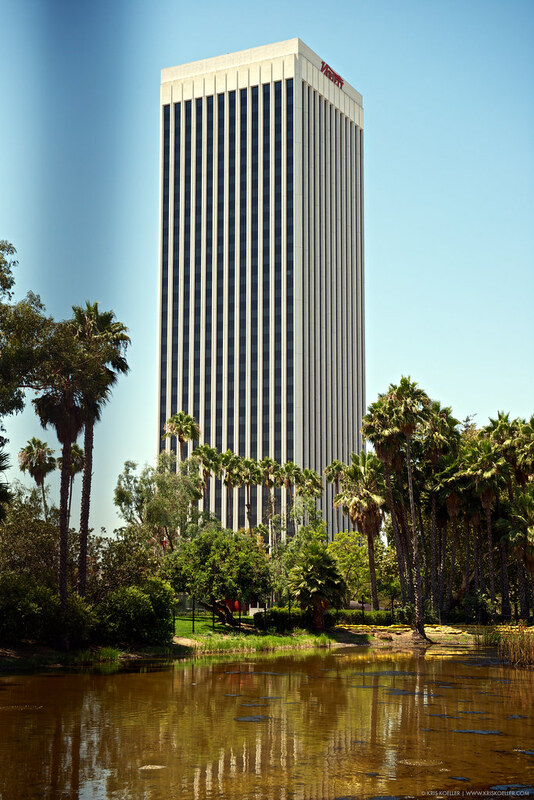 Next door and unrelated to the Page Museum or the La Brea Tar Pits, is the Los Angeles County Museum of Art (LACMA). We didn't visit the museum, but it features on it's grounds what it purports to be the, "World's Largest Rock on Display at a Museum." I don't doubt that for a moment, but the title seems self-serving. Nonetheless, it was pretty cool to see and we took a few photos nearby. 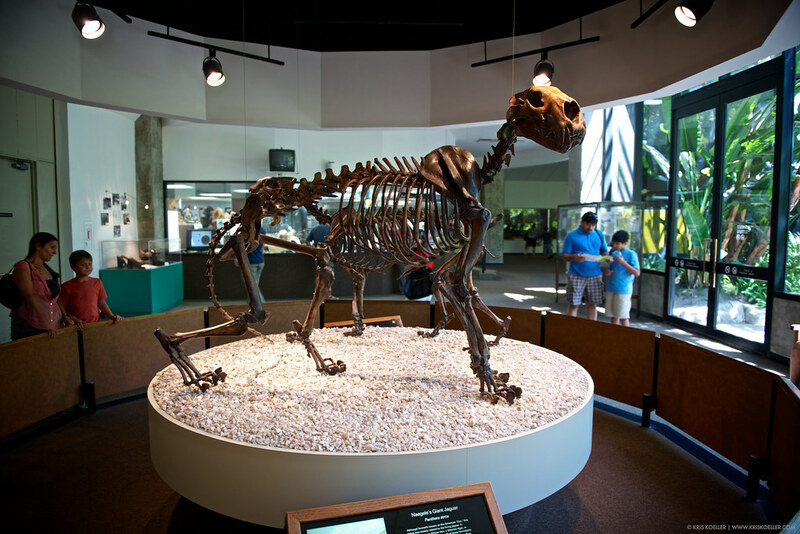 If you're a fossil or science geek, a visit to La Brea is highly recommended. 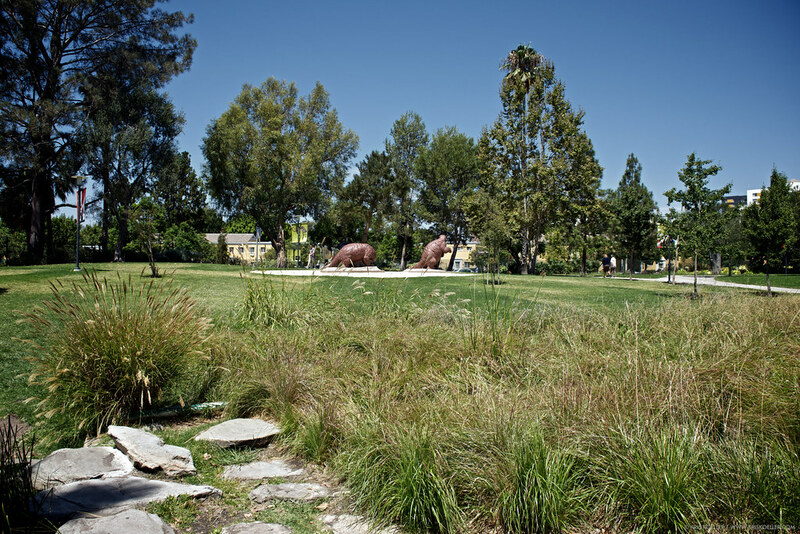 I had heard so much about the Tar Pits growing up, I quickly added it to our list of must-see sites for our short visit to Los Angeles. The whole visit took about 2 hours and runs you about $11 per person. A fine value. 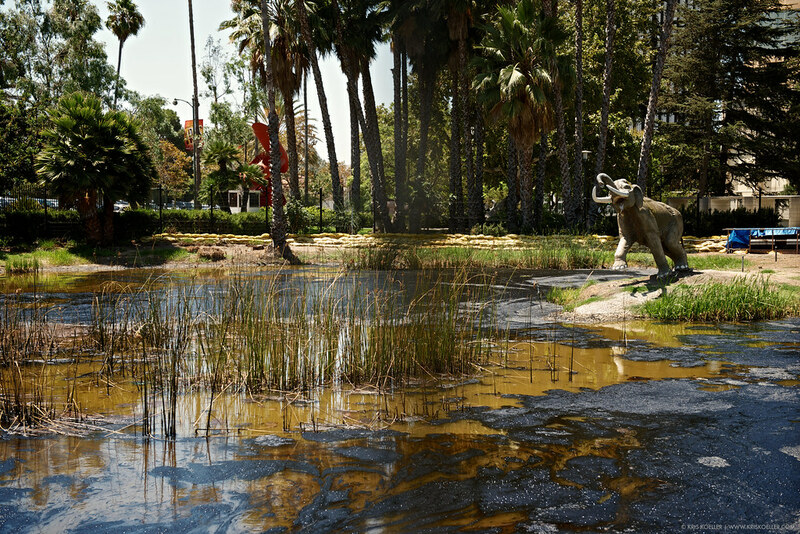 I was surprised at how few people in LA and elsewhere had ever heard of the La Brea Tar Pits. Have you heard of it? Regardless, it comes highly recommended.